Fresh apples and cheddar cheese are really good together. They form an excellent marriage between fruit and dairy. Only addition I would make would be to add sharp yellow cheddar cheese if it is available. Once I did this recipe and not only did I have a cheddar cheese crust I sprinkle grated cheddar cheese in with the apple filling. It came out creamy and yummy and it was like a it was like a apple cheese party in my mouth. For a top crust, double the recipe. Combine 2-1/2 cups flour, salt and sugar in a food processor. Add chilled butter; pulse until mixture reaches a coarse meal consistency. While processing, drizzle in ice water until a dough ball forms. Pour into a bowl; toss with cheeses. Pour onto plastic wrap; form dough into a ball. Wrap tightly and chill 1 hour. Toss apples with cinnamon, brown sugar and 1 Tbsp. flour until evenly coated. Pour mixture into pie crust; top with butter. 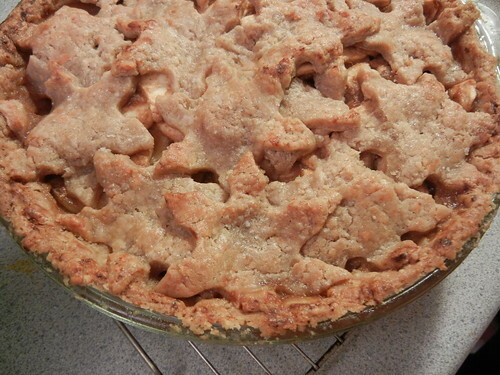 If desired, place top crust on top of apples; crimp edges to seal. Slice air vents into the top crust. Bake at 350 degrees for about 45 minutes. Cover edges of crust with foil if they begin to brown too quickly. Allow to cool slightly before serving.